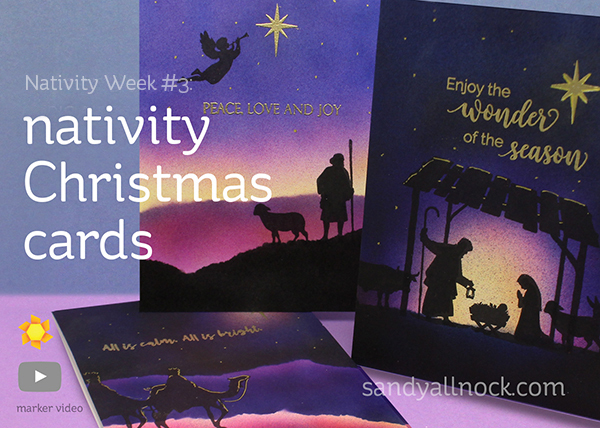 If you’ve been waiting for Nativity Week to get serious, this post is for you! While I created my beautiful backgrounds with a Copic airbrush, YOU can also do this with your own mediums! Try with distress inks…watercolor, powdered pencil – whatever you have that makes pretty backgrounds! Watch the video below or click HERE to see it in HD on YouTube. Penny Black has some really nice sentiment stamps – lots have a mix of Christian and secular sentiments. I’ll let you pick! Sandy, your cards are just perfect ! These colors are so sweet ! 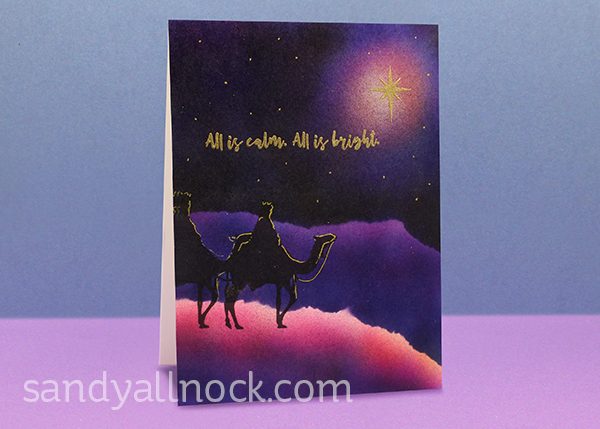 Absolutely gorgeous cards–the beautiful colors you used seem to glow! Your cards are absolutely beautiful! I love the different colors of light you created with the airbrush. For those of us with a limited budget could you share the Copic colors you used? These cards are absolutely gorgeous!! Thank you so much for the video!! Cool use of ripped paper to create natural looking edges. Lovely scenes. in the backgrounds is fabulous. Oh, my goodness!!! These backgrounds are STUNNING! Just wowzers. Absolute gorgeous Sandy and I love to see how you do this with the airbrush but talking about blending distress ink, just like any other medium, practice is what you always say! 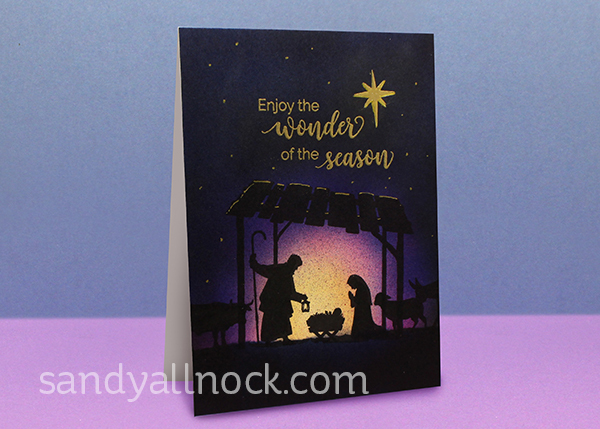 I hope you will make some more cards ( doen’t have to be Christmas cards) with solid stamps (and no use of the airbrusch LOL) because I never know what to do with the solid stamps. Another set of beauty cards Sandy! Thank you! Just beautiful! Again, I’m amazed! Sandy, you Goonie! If you think you’re not good at blending distress inks, you just have to PRACTICE! Now you know how the rest of us feel about your talent with Copics, watercolors, pencils, etc. And by the way, those new Distress Oxides make blending SO much easier – it’s like silk. That having been said – it’s really fun to watch you using that airbrush. These cards are absolutely gorgeous!